Terry graduated from Pacific High School in 1975. Upon graduation he attended California Polytechnic State University in San Luis Obispo. While attending Cal Poly, Terry wrestled on the varsity wrestling team all four years. He graduated from Cal Poly in 1980 as an Industrial Engineer and upon graduation he immediately began working in Silicon Valley. In 1986 Terry moved to Boston, Massachusetts and entered Holy Cross School of Theology. He graduated from Holy Cross in 1988 with a Masters in Theological Studies. Terry returned to the Bay Area in 1990 and again began working in Silicon Valley in Software Design. He currently works as an independent consultant as a Software Engineer. Terry is married to Olga Markou and they have a beautiful daughter together. They live in Redwood City, California. 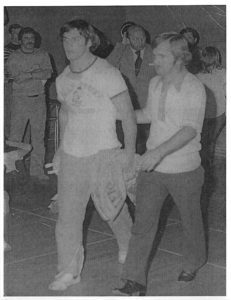 A two time State Champion 1974-75, Terry’s most inspirational and exhilarating moment was winning the state wrestling meet during his junior year in high school. It was only his second year of competitive wrestling and it was therefore a great honor to be up with the top wrestlers of the state.